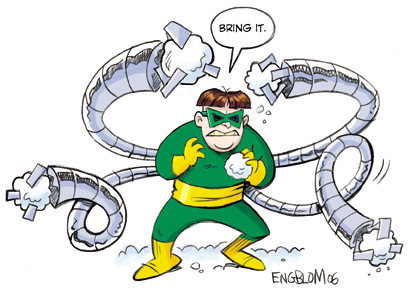 For some random reason, I woke up this morning thinking Doctor Octopus' theme song should be "Crazy Arms". No, I do not understand how my brain works. But it started me wondering what other songs would go well with established super-heroes. But pre-coffee, I can't think of any. Which is where you come in. Are there other songs that go perfectly with a comics character? Let 'em rip in the comments! “Thor” by Rebellion, I think, perfectly fits for Thor. Somehow the song “Phantom” by Valeriy Meladze (I’m sure you don’t know him) is associating with Batman. 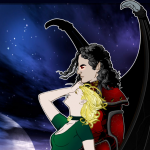 “Kalmageddon” by Lordi goes great for Mordru. For Spiderman (and possibly members of Hydra), ‘I don’t Like Spiders and Snakes’. Faster Kill Pussycat by Paul Oakenfold ft. Brittany Murphy for Black Cat. Or Catwoman. They’re almost the same character anyway. “How You Like me Now” by the Heavy for The Punisher, perhaps? I’ll have more time tomorrow to post. I have thousands of songs. And I am taking requests. I can think of songs but no superheroes or villains! Did I also mention I hate YouTubes “memory leaks” that cause the video to play all choppy. The Atomic Punk by Van Halen! That’s just off the top of my head, I’m sure there are more…………. Myro (12): Actually that was going the painfully obvious route. Songs based on actual comic book characters, however, you could throw in Powerman 5000’s song “Son of X-51” for Machine Man. You might have already but you guys should listen to kansas and see exactly what im talking about. Do you mean Ghost Riders In the Sky? @ Eryke #10- I forgot about CTD! One of my favorite bands too. @ Wade #15- they did use that dong in the Nick Cage movie, I wish I could remember the name of the group who did it. Phatchick #17 – It’s Spiderbait (Ghost Riders in the sky). Not sure if I spelled this correctly, though. Maybe it was Spiderbite. Ooh, one more! “Lament for a toy factory” by Dr. Steel goes perfectly for Toyman! And definitely “Game On” by Disciple for Wolverine. Or Hulk, take your pick. Actually, Stevie Ray’s “Coldshot” would be more apt for Captain Cold. My bad.